To meet the precise requirements of our customers, we are engaged in providing PU Anti Fungal Wall Coating Service. Non toxic solvent free high build protective & decorative coating. 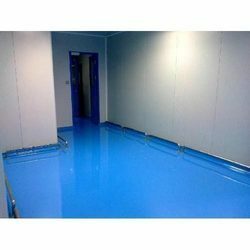 Two part epoxy floor and wall coating. Non-skid. Excellent abrasion and chemical resistance. Suitable for automobile workshops, show rooms, pharmaceutical factories, potable water tanks. Available in various shed. Coverage: 3 to 4 sq. m per kg. To meet the precise requirements of our customers, we are engaged in providing PU Wall Coating Service. Being an eminent company, we are involved in rendering Durable Exterior Wall Coating Service.